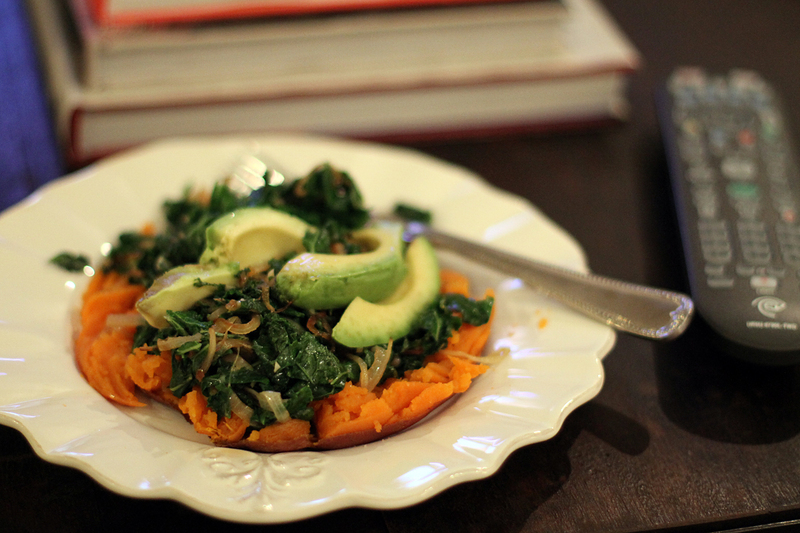 This is one of my favorite simple meals that I tend to make when I’m just cooking for myself. It’s super low maintenance (read: one pan) but has tons of flavor and is totally satisfying. It’s just simple ingredients that are easy to cook and happen to combine quite well together. By adding extras like garlic and lemon too, simple vegetables turn into the world’s simplest gourmet tasting meal for one. Did I mention how simple it is? On a night when it’s just me, I can throw this together in about 30 minutes and be on the couch with dinner in one hand and the remote in the other, ready to relax and catch up on the girly portion of our DVR. Preheat oven to 350 degrees, wrap sweet potato in foil and bake 30-45 minutes, until soft. In a large skillet, heat oil over medium heat. Add onion and saute 5-7 minutes, until translucent and beginning to brown. Add garlic and cook 1-2 minutes more. Add kale and stir to coat with oil. Cook about five minutes until greens begin to wilt and shrink. When sweet potato is done, unwrap and cut it in half. Mash the potato with a fork and then top with greens mixture. Add sliced avocado, sprinkle with salt and give it a little squeeze of lemon. I just made and ate this! Mostly cause I went on a mini vacation and fell off my no sugar/dairy/wheat wagon. It was like tasty food rehab! Your blog is great, glad I found it. Thanks for the recipe.